Walking Fort Bragg: Hike it, Bike it, I like it! Hike it, Bike it, I like it! 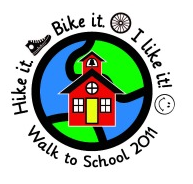 The 2011 Walk to School Day Slogan: "Hike it. Bike it. I like it!" Wednesday, October 5th parents are asked to form, "Walking School Buses" and "Bike Trains", so children can safely travel to school. My brother and I are still at it!